September 14, 2018, New Delhi, India–Month of August witnessed raining visa approvals for Visas Avenue clients, as VA team obtained as many as 23 visa approvals in this month for Canada and Australia immigration applicants. Visas Avenue is a popular name in the immigration industry. It has been a mentor and guide of thousands of immigration applicants in the last few years. The qualified and professional immigration experts at Visas Avenue has helped several immigration applicants in last few years to acquire visa approval for Canada, Australia, New Zealand, USA, UK, etc. countries. The Visas Avenue team specializes in Canada and Australia immigration process. The expertise, experience and efficiency of the VA team are evident when you look at the record as to how many people have obtained their PR visa approval for Canada and Australia through Visas Avenue. 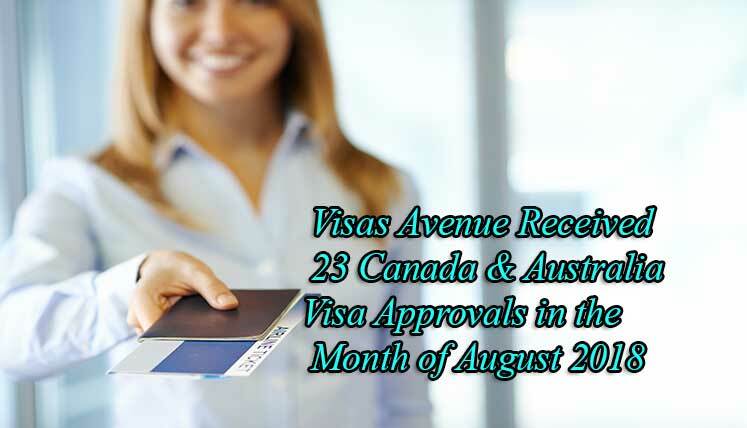 As the list exhibit, VA team got Canada and Australia permanent residency visa approvals good numbers for their respective clients in the month of August. Moreover, the team also helped the applicants obtain Visitor visas for Canada and Australia. Visas Avenue has got its Visa Consultancy office across length and breadth of the country, i.e. Delhi, Mumbai, Bangalore, Hyderabad and Chennai. Application follows with immigration office, etc. If you wish to apply and obtain Visa for Canada, Australia, New Zealand, USA, UK, etc. countries, you may get in touch with Visas Avenue qualified and most experienced immigration and visa experts. You are promised to get world class immigration solutions from the vastly experienced immigration experts and professionals, right from the beginning till approval of your desired visa.